Walking distance to Westminster Abbey and Parliaments/Big Ben. About a mile away from Victoria Station. But there are multiple bus stops around the hotel to go around the city. A Uber ride to Victoria Coach Station from the hotel costed Â£5.60. We were able to check in early after an overnight flight and took a nap. Breakfast buffet was good as well. Overall we enjoyed our stay. Have just come home from a 2 week stay at this hotel. All I can say is thank you so much for making our holiday memorable and for a truly wonderful experience. Management were truly caring and committed to making our stay there everything we could have hoped for and much more besides. Thanks to Matt and Riyas in particular, who went above and beyond to ensure everything went as smooth as clockwork, and who went out of their way to ensure we had a wonderful holiday. The room was quiet and very clean with everything you need to make your stay comfortable. Had a wonderful buffet breakfast each morning where the staff were attentive and provided us with everything we needed or asked for in a pleasant and friendly manner. If you're thinking of taking a trip to London, this hotel is in a great location with easy access to all the sights and within walking distance of shops and transport. There's always a cab out the front should you need one, and it's close to the river for clippers or just a stroll along the foreshore. Thanks again for a wonderful stay. The Doubletree Westminster was a nice place to stay. Quiet area, staff treated us well. Many options to eat for the hotel breakfast. Two restaurants in the hotel. Restaurants and pubs within walking distance. Bus stops and underground close. Thames right behind the hotel. We had afternoon tea. Not a fancy tea room but the staff treated us like royalty and the tea and sweets were delicious. Thank you for taking the time to provide your review. We are very sorry to learn of the service issues encountered during your time at the property and your disappointment with the guest room. We strive to provide our guests with the best possible service at all times and we regret that expectations were not met on this occasion. I can only offer my sincere apologies for a less than satisfactory experience. Your feedback is very important to us as it allows us to make improvements where necessary. Your comments will certainly not go unnoticed. We hope you will return the next time you visit the area so we may better demonstrate the value and hospitality you expect and deserve. 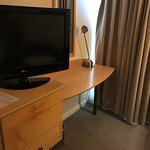 Really nice staff, great hotel, quiet location, excellent room. Close to Westminster. Excellent taxi service. Not a lot of great restaurants and pubs nearby. Underground about 10-15 minutes away.